Changes can take place over limited stretches of the Dales Way due to local conditions or improvements to the route. It can take many years for these to appear in all guide books and on maps. The changes are shown here, with the approximate year of change shown in brackets. This new route diversion takes walkers around the farm buildings at Burton House and along a good farm track to cross a stream before rejoining the original route. The previous path passed through the farm buildings and then followed a route which was not on the line of the definitive right of way. It then crossed the stream at a very muddy stile. The new route is well waymarked and straightforward and should offer no difficulties if walkers follow the signs. When leaving the A6 enter the access lane to Burton House as before. Watch for a walker's gate on the left which takes you onto a parallel farmer's track on the other side of the wall, to bypass the farm buildings to the east and south. The track then descends a field to a gate and crosses the stream, before turning left alongside the stream to another gate, rejoining the original path. UPDATE 2015: Due to the increase in dangerous traffic, this originally optional route is now the OFFICIAL ROUTE and is waymarked accordingly. This route change takes a small section off the very busy road at Sprint Bridge, on the approach to Burneside, taking a slightly longer but much safer route via Tenement Farm. The new route crosses the bridge at Sprint Mill (SD 5158 9611), between buildings, bearing right along a waymarked footpath through a pretty garden area. A stile leads into a field with a wall on the left, following this to a large metal gate. The way continues west, with the wall now on the right, through a couple of gates to pass Tenement Farm. Continue out along the farm access road to join a quiet country lane, left, down to the busy road near a junction. A right and left bring you quickly onto Hall Road and the roadside path down towards Burneside. This is now the official route for Dales Way walkers. This route change takes a small section off the road and was made possible by change to a right of way that came about in 2000, the same time as the path across the west coast railway was closed. It is on the section between the M6 and Grayrigg. As you descend from the stile onto the minor road that leads to Thatchmoor Head (SD 5836 9602), the route previously turned left along the road to the rail way bridge. To avoid the road walking, cross the road and mount the stile which now has a Dales Way finger post erected. Following down the side of the field turn left at the bottom corner and after climbing [and descending if you want to make progress] a rather large ladder stile, continue to walk alongside the hedge beside the railway line, then emerge through a gate to the railway bridge. Heading west after crossing the M6, the original route of the Dales Way crossed the railway by a foot crossing. With the upgrading of the line this has become very dangerous, and rather than construct an unsightly footbridge, the route has been closed. Heading west, the new route now follows along the lane from Hardrigg and around a right turn as before. Where the old route turned left through a gate into a field and made its way down to the railway, the diversion now commences. Instead of cutting down across the field, one turns right immediately after the gate and follows a newly created path along the field edge parallel to the lane. On reaching the railway, it rejoins the lane to cross the road bridge. Immediately on the north side of the bridge a new path has been created running west along the railway boundary to rejoin the original route on the north side of the closed level crossing. ( Look carefully for the point where one turns away from the railway towards Greenhead ). This new route has been waymarked and new stiles erected as needed. A diversion has been made by the Yorkshire Dales National Park where the Dales Way leaves Grassington and heads north. This is to avoid having to pass through the busy farmyard of Town Head Farm. The new route leaves Chapel Street before reaching the farm, turning right up the existing right of way up Bank Lane. This is followed round to the left and on until the right of way makes a sharp right turn. A new path has been constructed from here across fields in a westerly direction to rejoin the present route of the Dales Way well to the north of the farm. The present line of the route from the farm to this point has been closed. The National Park has clearly signed and waymarked this significant diversion. 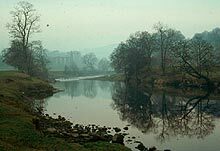 Only a year or two back the route of the Dales Way was revised downstream from Dent in order to avoid the road walking between Ellers Bridge and Rash. However since that time a completely new footbridge has been constructed at Brackensgill, where there was previously only a deep ford. The official route of the Dales Way has now been changed to make use of this. So do not cross Ellers Bridge, but continue along the lane down the SW side of the dale until the bridleway leading to Brackensgill Bridge can be followed down to the river. Short stretches of footpath have been created to give access to the bridge. Continuing, the main valley road is crossed almost directly to climb on another bridleway up the other side of the dale and, after a left fork, one duly joins the contouring track to rejoin the original route above Rash. This route is very clearly shown on the Explorer (Outdoor Leisure) map. It should be noted that this is now the official and recommended route, but the original route and the diversion from Ellers Bridge are on rights of way and can still be used if preferred. One of the worst sections on the original official route of the Dales Way was the stretch along the dangerous B6160 between Addingham and Bolton Bridge. A new section of the route has been created to avoid the majority of this road walking. This follows a line through the fields parallel to the wall along the road side. This has been made possible by the goodwill of the Bolton Abbey Estate and North Yorkshire County Council in creating the right of way and permissive path that were needed. Dales Way sign posts and waymarks are now in place. Coming along the river from Addingham, on reaching the road one can now go almost directly across and pass through a new kissing-gate into the grounds of the Friends Meeting House. Walkers are very welcome to make a stop here. A gravel path leads round the building to join the drive to Lobwood House. Almost immediately by a metal gate you will find a stone stile in the wall on your right. Cross this and make your way parallel to the road and fairly near the wall. Shortly you must ignore a wooden stile which leads back to the road. Continuing parallel to the wall you soon cross another wall by a stone stile followed by a footbridge. Eventually you will reach the gate at the far end of the field which is the access to the road. A stone stile on the right takes one past this and onto the road at roughly the brow of the hill. Crossing with care one can soon take advantage of a rudimentary footpath on the river side of the road. A diversion has taken place, which affects the route of the Dales Way at Staveley. This may not yet be noted in some guidebooks. On approaching Staveley from the Burneside direction, the route no longer follows the walled track all the way to Sandy Hill Farm but bears left up to the road. This is well signed and waymarked.